When Will the Philippines Legalize Divorce? Though challenges remain, there are signs that the country is slowly moving toward changing its stance. A major push to legalize divorce in the Philippines, one of the world’s most populous predominantly Roman Catholic countries, promises a showdown between the more conservative elements of the Catholic Church and the progressive wings of parliament and civil society. Currently, the Philippines is one of the few countries in the world where a divorce cannot be sought. But now a new bill on divorce has passed the lower house in the Philippines. Though the prospects of the bill itself are still unclear, it has nonetheless once again exposed a clear divide that remains on this question in the country. The Catholic Church still wields immense power in the archipelago, where some 86 percent of the population identifies as Catholic (the Philippines, along with Timor-Leste, are often cited as being the only two predominantly Catholic countries in Asia). That has always meant that changing the conception of divorce would be difficult. Civil society push for reforms began decades ago. Over time, though bills themselves have been scrapped before even making it to the floor, public opinion has shown signs of shifting, with those in support of divorce laws now in the slim majority. As this has occurred, some have wondered whether the country is approaching a point where the wheels of progress might be moving too fast for the church. We saw another development on the score recently when the Act Instituting Absolute Divorce and Dissolution of Marriage in the Philippines, better known plainly as the Divorce Bill, passed a third reading in the Congress last week. The bill is considered by some as being “pro-woman.” While it does not offer no-fault divorce, a major feminist imperative around the world, it does directly address the most pressing concerns for Filipino women. Supporters of the bill argue divorce is a vital safeguard to addressing the Philippines’ problem with violence against women, which is a serious one. Data from the National Statistics Office shows one in five Filipino women aged between 15 and 49 have experienced some form of violence against women. That number climbs to a staggering one in three when it comes to women who are separated or widowed. The Philippine Commission on Women suggests this increase shows violence against women is a massive cause for separation, but without the option to divorce these women are often left with little legal recourse and ambiguous custody arrangements. This bill would ensure recognition of all children as “legitimate” and favor the mother retaining majority custody of any children seven and younger. A case study published by the New York Times earlier this week focused on Lennie Visbal, a Philippine national currently based in Thailand, who has not seen her husband for 13 years. Lennie’s case underlines the major issues with the status quo, which the bill seeks to solve. Lennie officially shares equal custody with her estranged partner, despite him not being involved financially or otherwise, and he is eligible to claim her social benefits and inherit property in the case of her death. Under the reforms, she would be free to file for divorce under the separation of five years or more provision. As of now, a lengthy and costly petition for annulment is the only way for Filipinos to remove themselves from marriage, leaving poor women particularly vulnerable. Instead, many are just opting out of marriage at all. National Statistics Office data shows that from 2005 to 2015 the rate of marriage dropped a whopping 20 percent. President Rodrigo Duterte famously had his marriage annulled in 2000 during his time as mayor of Davao City, but the process has not inspired him to spearhead divorce reforms, with the president indicating he could veto the bill at the senate stage. While previously stating his support for marriage equality – much to the horror of the Church – divorce is one reform too far for Duterte. Through a spokesman, the president has said divorce is detrimental to any children. He has not clarified his stance in cases where there are no children or, like with his annulled marriage, the children are grown adults. The hold of the church will be tested when the bill is debated in the senate. Independent Senator Panfilo Lacson is certain the bill will go no further than it has. 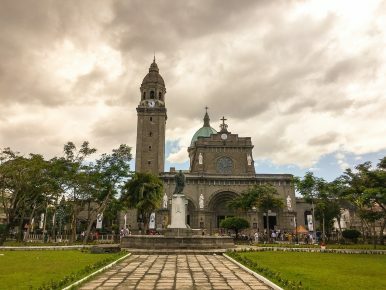 “In effect it is dead,” he told Catholic news site UCA, “we are a Catholic country and we are not ready.” But even if this bill might be dead, the Philippines’ debate on divorce will live on as it has for decades, as will the societal problems and challenges that come along with preserving the status quo on this front.